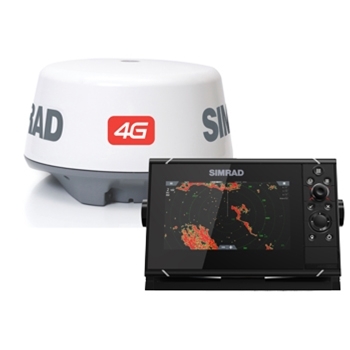 Simrad’s NSS 7 Evo3 and 4G Radar Bundle is a top choice in Marine Electronics. A 7” Combination GPS Fishfinder with Dual-Channel CHIRP and 4G Radar packaged together at an affordable price point. 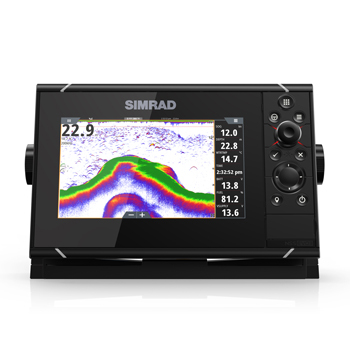 The Simrad NSS7 Evo 3 combination unit is your go to, do everything unit. This aesthetically pleasing 7’’ robust Solarmax HD display can be flush or bracket mounted, withstands the elements and allows the operator to go between the keypad with rotary dial to the all-weather touchscreen fluidly. Built in dual-channel chirp sonar offers StructureScan and ForwardScan imaging with confidence with a reliable wide range from finding fish to seeing structure, and seeing what’s below your boat with impressive clarity even at deeper depths. Built in Insight charts will provide you with navigational aids, buoys, mile markers, and more to get you from point A to point B efficiently. If the built in mapping isn’t detailed enough, simply add on a CMAP Max-N+ or Navionics Platinum+ chart for added detail of depth contours, marinas, enhanced map views and more. Although average in size, the NSS7 goes above and beyond with what it’s capable of. A built in 10 Hz GPS/Glonass receiver is accurate and will update and pinpoint your location on the included Insight charting for marking waypoints of all your favorites fishing spots! The included Simrad 4G solid state radar can detect and separate targets at ranges from down to 200’-36nm, and incorporates a dedicated solid state transmitter and receiver inside the radome which continually transmits and listens for different frequency wave lengths for object identification, making the Broadband 4G Radar much safer for use and mounting locations than conventional microwave, pulsed based radars of the past. Adding on a Halo compression open array radar series which provides modes such bird, weather, harbor just to name a few with unparalleled target separation in both long and short ranges. Built in W-Fi provides access to GoFree online, and with your tablet or smartphone you can see what’s happening or take control via a Simrad autopilot on the NSS 7 screen from anywhere on the boat! Connecting additional components via NMEA 2000 lets you control stereo, monitor engines and other devices for this combo unit. Plan your next fishing venture with Tripintel technology which is a nifty tool allowing power boaters vital information such as how far will the remaining fuel get you and track data such as max fuel used, total distance that you’ve travelled and this is recorded so you can access it later for reference. All of this is laid out on one screen and once you start using it, you will never go back to not. If you are limited on space Simrad NSS7 Evo3 unit covers all the bases with performance and reliability, in any way you choose when venturing out on the open water. Comes Packaged with Simrad 4G Radar! Navico's XSONIC TM150 Transom Mount Transducer CHIRP, Depth and Temp. 9Pin Black XSONIC Connector. Compatible with Lowrance HDS Carbon and Simrad NSS Evo3 Series. Know depths in front of your boat with the Simrad ForwardScan Transducer. Stainless Steel Thru hull with Fairing Block. The Lowrance 50ft Ethernet Cable connects Lowrance HDS units to other Lowrance Network Devices. Choose Mix & Match cable below for your application. Navico's XSONIC SS175 Stainless Steel High Wide CHIRP Transducer is designed for Fiberglass and Wood Hulls with a Deadrise of 0°-7°. Depth and Temp, 9 Pin XSONIC Black Connector. Compatible with Simrad NSS Evo3 and Lowrance HDS Carbon Units. Navico's XSONIC SS175 Stainless Steel High Wide CHIRP Transducer is designed for Fiberglass and Wood Hulls with a Deadrise of 8°-16°. Depth and Temp, 9 Pin XSONIC Black Connector. Compatible with Simrad NSS Evo3 and Lowrance HDS Carbon Units. Navico's XSONIC SS175 Stainless Steel High Wide CHIRP Transducer is designed for Fiberglass and Wood Hulls with a Deadrise of 16°-24°. Depth and Temp, 9 Pin XSONIC Black Connector. Compatible with Simrad NSS Evo3 and Lowrance HDS Carbon Units. Navico's XSONIC SS175 Stainless Steel Low Frequency CHIRP Transducer is designed for Fiberglass and Wood Hulls with a Deadrise of 8°-16°. Depth and Temp, 9 Pin XSONIC Black Connector. Compatible with Simrad NSS Evo3 and Lowrance HDS Carbon Units. Navico's XSONIC SS175 Stainless Steel Low Frequency CHIRP Transducer is designed for Fiberglass and Wood Hulls with a Deadrise of 16°-24°. Depth and Temp, 9 Pin XSONIC Black Connector. Compatible with Simrad NSS Evo3 and Lowrance HDS Carbon Units. Simrad NSE Video/Comms Cable (8 pin conn. to bare wires for NMEA and 2 RCA female for Video in Port one and two) 2 Meters. 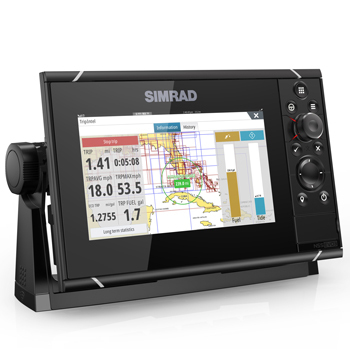 Simrad's OP50 Wired Remote for NSS Evo2, NSO Evo2 and NSS Evo3 MFD'S. The OP50 Portrait has multiple mounting options and includes a single control rotary dial and dedicated keys for MOB, Autopilot Engage/Standby, Home, Menu, Window, Mark/GoTo, Exit and Power. Airmar Low Profile Stainless Steel 20 degree tilt, Medium Frequency CHIRP 1 KW transducer. Includes 30' cable and Black Navico 9-Pin Connector. Simrad’s NSS12 Radar Bundle offers a complete package. Detailed Insight Charting, 10Hz GPS Receiver, Dual-CHIRP Sonar and 4G Radar are all included in this package! Built-In GoFree Wireless allows on the go software updates, map downloads and tablet and smartphone pairing for Viewing and added Control with Tablet. Simrad’s NSS 9 Evo3 and 4G Radar Bundle packaged together at an affordable price point. 9” Touchscreen and Keypad Controlled Chartplotter, Detailed Insight Charting, 10Hz GPS Receiver, Dual-CHIRP Sonar and 4G Radar are just the beginning!